3D AIM Animation is a perfect 3D Animation Software, add unique pictures and animations to your web site, wallpaper, advertising, presentations, training materials, and cards. Express your creativity and artistic abilities. Easily create pictures and animations with sound using multiple, textured 3D models on backgrounds with 3D effects. 1,100+ 3D models available for registered users to download. Import function for VRML models with texture and color; 3D rotate, pan, and zoom and shaded or polygon display. User defined transparency, colors, textures, motions, orientations, light position, and sounds; 3D model editing including fixing common surface problems on 3D models and rescaling in x, y, or z dimensions. 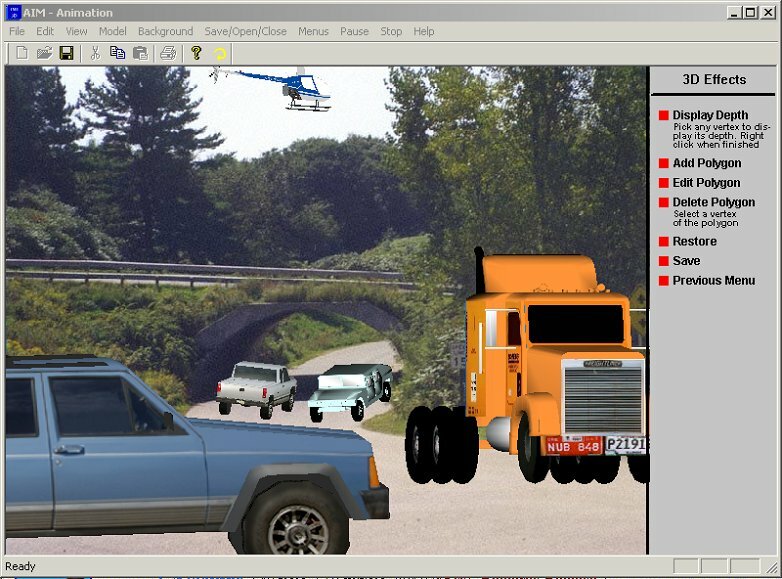 Functions to extract sub-models from a model; 3D effects for 2D backgrounds; special functions for quickly creating pictures, with 4 user selectable quality levels, from 3D models and backgrounds. User definition of depth and orientation for 3D models at arbitrary points on the animation path; special motion options including closed paths, circular paths, and rotations. Depth specification for elements of backgrounds; functions for merging up to 30 model motions into realistic 3D movies with user-defined frame counts; and table driven motion and sound editing. While the product is based on the advanced mathematics used in CAD/CAM systems, it is designed to be used by people of all ages and experience. JustCad - Make cad drawing as simple as possible. 2D & 3D Animator - 3D Computer Animation Software, produces high-quality 3D text, photo, titles, buttons and banner ads for Web. 3D AIM Animation - perfect 3D animation software, add unique pictures and animations to web site. Zoner Draw 4 - Quickly and easily draw graphics for your website. Liatro Button Maker - Vector webbutton maker for creating webbutton. Liatro SWF Decoder - Extract all resources from flash movie SWF file.